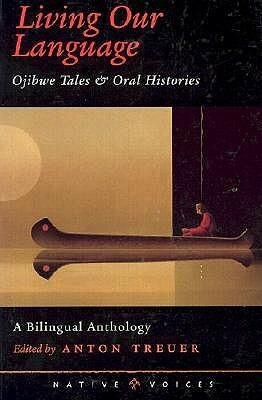 Living Our Language: Ojibwe Tales and Oral History, edited by American/Ojibwe scholar Anton Treuer, is a collection of cultural narratives, tales and remembrances recorded by Treuer in conversation with Ojibwe elders. The collected narratives of the elders he spoke with are presented in both Ojibwe and in English translation. Treuer's intent in publishing these narratives is not just to preserve the legacy of the elders, but to offer material that will serve the vital project of preserving the language itself. As he says in the Introduction to the volume, " 'We’re not losing our language, our language is losing us,' says White Earth elder Joe Auginaush. I have been both haunted and driven by that thought for many years now. The current peril faced by the Ojibwe (Chippewa) language is a matter of a declining number of speakers and a people who have lost their way, rather than a language that is lost or dying. The Ojibwe language, spoken by as many as 60,000 Anishinaabe people in Michigan, Wisconsin, Minnesota, North Dakota, Quebec, Ontario, Manitoba, and Saskatchewan, is alive. The grammar, syntax, and structure of the language are complete. The oral tradition and history of the Ojibwe are still with us. Yet in many areas fluency rates have plummeted to unprecedented and unsustainable levels. Especially in the United States, most speakers are more than forty-five years of age. In some places, the fluency rate is as low as one percent. As the population of fluent speakers ages and eventually leaves, there is no doubt that the Ojibwe language will lose its carriers. We are not losing our language. Our language is losing us. "Preserved in the collected oral histories of the elders interviewed by Treuer are the memories of traditional ways of life, seasonal activities, and aspects of those ceremonies which may be written down or shared with those not Ojibwe (Treuer makes it clear that he has published nothing that can only be transmitted orally, or only within the Ojibwe people). The personal histories also speak of transitions to other ways of living and their consequences. Some elders directly address their concerns about the lost of their language and of their traditional spiritual knowledge and traditions. Among the elders Treuer interviewed are those who are Drum keepers, entitled to teach about and conduct Drum ceremony, which is central to Ojibwe religious practice. Although direct information about the ceremonies is part of the knowledge that may not be written, only transmitted orally, those who are Drum keepers, who 'carry a drum' or who 'carry a pipe' talk about the importance of preserving Indigenous religion as another vital aspect of their culture and way of life. A valuable contribution to the attempt tp preserve Indigenous languages and to record the memories of a people to whom the memories of elders are a vital element of cultural transmission, an element that has been severely undermined by colonialism and forced assimilation. This book is a collection of stories told by Ojibwe elders. A fascinating read and insight into the mindset and culture of an indigenous people of America. A little difficult to read at times due to the stories being a transcription of verbally communicated experiences. Perhaps some heavier editing would have improved the flow. Nonetheless, an interesting read. Living our language is a unique book edited by Anton Treuer. The words in the book itself, are a collection of stories told in the Ojibwe language by elders from tribes in Minnesota. These stories translated, by the elders, for Anton, are written in both Ojibwe and English alongside each other. Given the reader an experience of understanding between the languages. Anton Treuer has done a tremendous job of bringing the ojibwe language and culture out of the 1970’s. Where the stories were all about the American Indian movement and revolution, Anton’s writings have given readers an insightful book where readers can learn ojibwe culture from the people who were there. To look at the not so distant past and hold a light to a few men and women who wanted their language to survive. Anton’s work in ojibwe culture has lead him to be highly regarded in the Ojibwe community. His work preserving elders’ stories and testimonials have been a lifelong work in progress. He does speaking engagements to provide information to non-natives about ojibwe culture and lectures in Indian country on the sacred use of tobacco. In addition to have written many books, and has filmed television segments on various topics to be broadcasted on PBS, Anton has released YouTube videos containing some of the cultural traditions he feels are important of everyone to know about ojibwe culture and history.The stories told in Living our Language are by men and women born in the early 1900’s. They are war veterans, boarding school survivors, and carriers of Native American traditions. Jim Clark is one of them. His tales are funny, comforting and give you a clear understanding of what life was like when rivers had their anishinabe names and everywhere you traveled was on foot. This book would be enjoyable to readers looking to learn about the lives of a few Ojibwe, though a funny and sometimes serious set of short stories, although I believe, the intended audience for this work, is people who want to learn the Ojibwe language. This Bilingual anthology is a helpful tool when learning to read Ojibwe as it is written in English lettering. I found, when using this book as a learning tool, there are exercises you can practice, such as picking out words in the ojibwe text compared to the English text and matching them together. Even for those readers who cannot read ojibwe or know the sounds of the language, they can get a since of learning by this matching technique. For those that are familiar with the ojibwe language, this matching game can be done in stages, going from words, to sentences. If looking at this book at face value, the firsthand accounts of Ojibwe life are invaluable to the community they come from, the stories of their lives, and stories that have been passed down through oral tradition that give light to the way values and morals were thought to young people are pieces of history that Anton has preserved for his people. Anton Treuer - Dr. Anton Treuer (pronounced troy-er) is Executive Director of the American Indian Resource Center at Bemidji State University. He has a B.A. from Princeton University, M.A. and Ph.D. from the University of Minnesota. He is Editor of the Oshkaabewis (pronounced o-shkaah-bay-wis) Native Journal, the only academic journal of the Ojibwe language and author of 9 books. Dr. Treuer has sat on many organizational boards, including the White Earth Land Recovery Project, Sanford/MeritCare Health System, and the Minnesota State Arts Board. Dr. Treuer has received more than 40 prestigious awards and fellowships from many organizations, including the American Philosophical Society, the National Endowment for the Humanities, the National Science Foundation, the MacArthur Foundation, the Bush Foundation, and the John Simon Guggenheim Foundation.